Ted collects his copy of The Shining from Father Seamus Fitzpatrick. While there, Seamus shows Ted his collection of war memorabilia. All of it is from the German side. The room looks like a shrine to the Third Reich, and it also includes a Nazi war veteran. When Ted gets back to the parochial house, Mrs Doyle injures her back falling from the roof and Ted and Dougal have to take over her cleaning duties around the house. As a laugh, Ted sticks a lampshade on his head and does an impersonation of a Chinaman. He looks out of the window and sees three Chinese people looking back at him. This sends rumours circulating around Craggy Island that Ted is a racist. 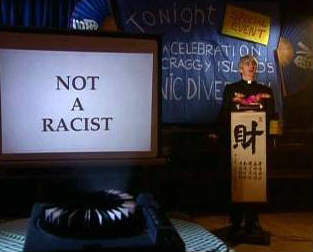 Trying to make amends, Ted decides to give a slideshow presentation demonstrating the cultural diversity that exists on Craggy Island. This wins over the Chinese families, probably due to the provision of free alcohol. Ted and Dougal, along with the Chinese family, return to the parochial house for a nightcap. When they go into the living room, they are greeted with the sight of Father Fitzpatrick's Nazi memorabilia bedecking the walls. Apparently, Father Fitzpatrick and his Nazi associate inadvertantly took cyanide pills instead of valium ones. The collection was bequeathed to Ted and Mrs Doyle put it on display. As a last act, Ted sends the Chinese family more alcohol. Father Jack emerges from the box in full Nazi attire having drunk all the liquor. Craggy Island Farmer: I hear you're a racist now, father. Father Ted: But best of all the Chinese people themselves. Look at them there, aren't they great? The Chinese; a great bunch of lads. The opening scene shows Ted at the luxurious Castlelawn parochial house, Dublin. Ted was possibly promoted as a result of winning the Golden Cleric award in the previous episode. Ted is sent back to the Craggy Island parochial house after some discrepancies over his expenses. Dougal has a pet hamster Reynaldo, his new companion after Ted left Craggy Island. Jack spends the whole episode in small spaces such as a grandfather clock, a chimney, a wardrobe and a wrapping box. Ted explains to Dougal that you should never buy black socks from an ordinary shop as they are really very very very very very very very dark blue. There is a Chinatown on Craggy Island. 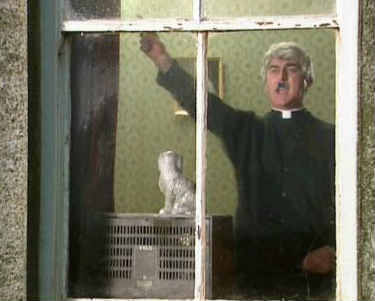 A perfectly square bit of dirt on the window pane makes Ted look like Adolf Hitler when he waves to the Chinese people outside. Ted's slideshow features; an unnamed black man, the Great Wall of China, Mao Zedong, Mr Miyagi from The Karate Kid, A Maori, Cato from The Pink Panther, Ming the Merciless from Flash Gordon, two photographs of poor Chinese people and a subliminal image of Ted with the words NOT A RACIST. The pub Ted visits is a real pub, Vaughan's in Kilfenora, County Clare. When this episode aired on Channel 4 it was dedicated to the memory of Dermot Morgan. This was the first episode aired after the death of Dermot Morgan. It was held back a week for this reason.